Thanks so much for all the great advice about how to fix my trapeze dress. 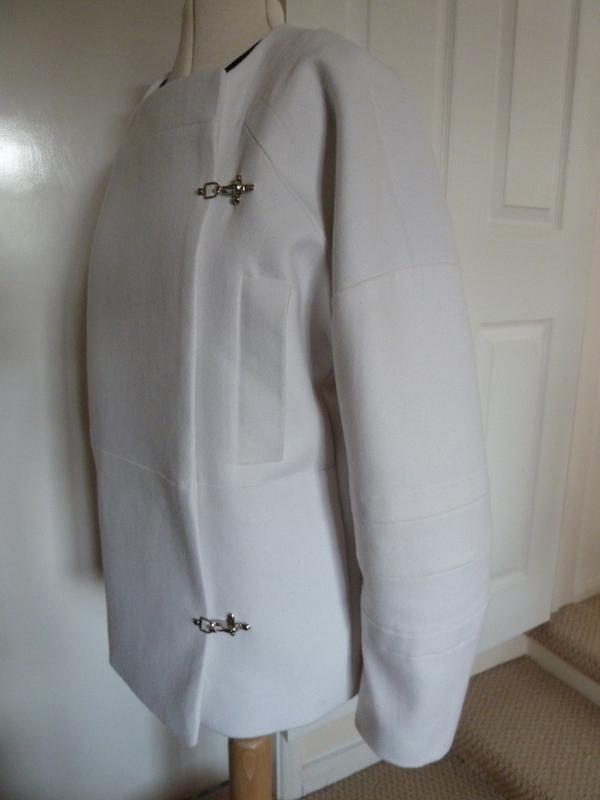 I finally found a source of zips of the right style and length on eBay, so I’ve ordered one. Fingers crossed it does the job. 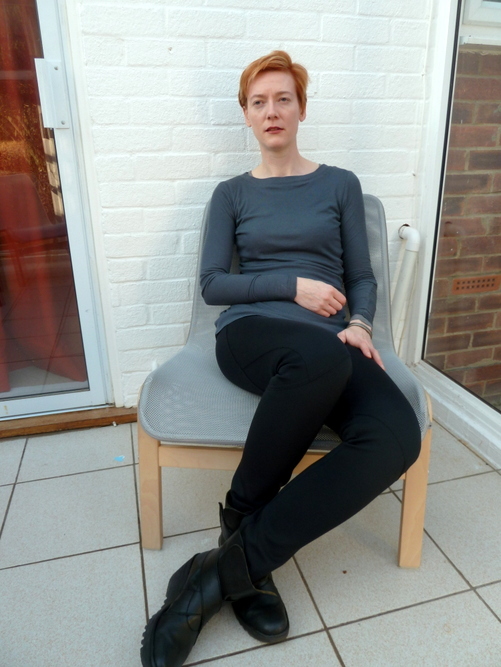 Meanwhile I’ve been making the trousers from Vogue 1378, inspired by Shams’ version. 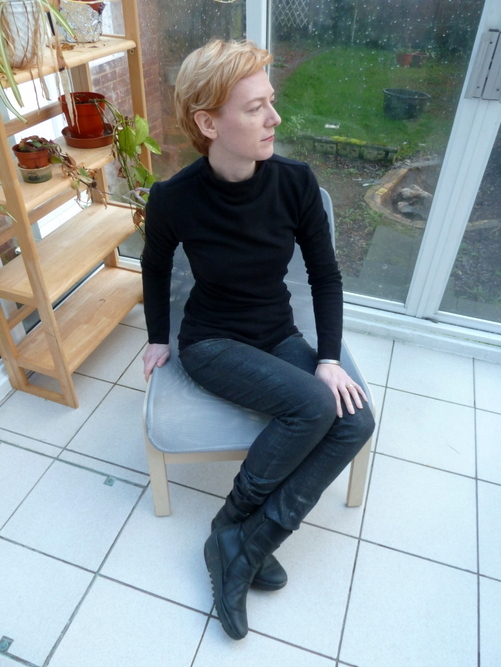 I’m using a very lightweight neoprene instead of the doubleknit the pattern recommends. It seems to be working out pretty well, but the frustrating thing is that the neoprene is black, and I’m sewing by artificial light, so it’s impossible to see any of the cool seam detail when trying them on. They just look like black leggings. 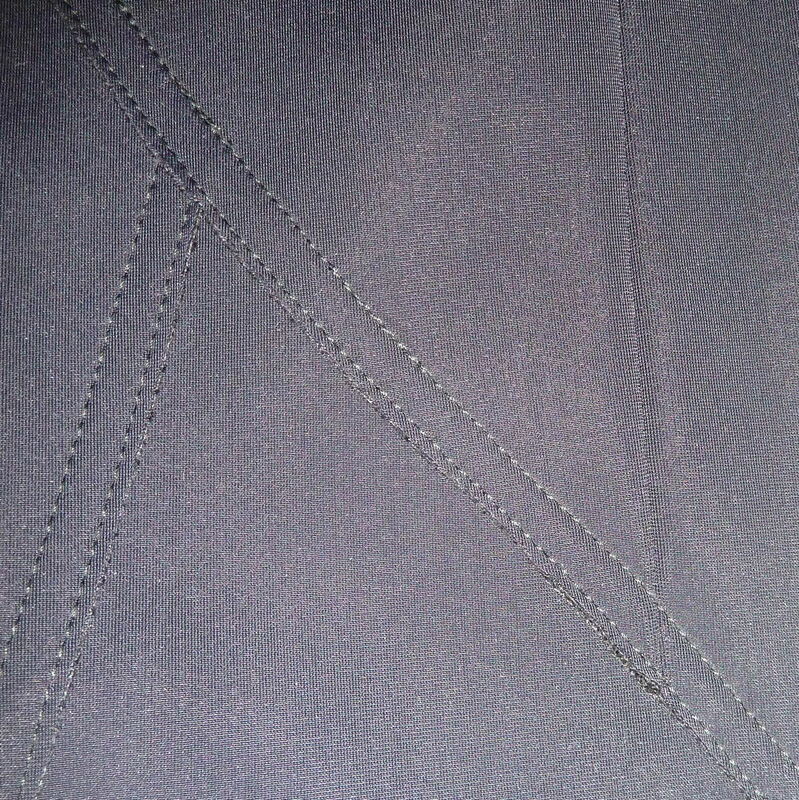 I did manage to get some photos of the lapped seams using the flash on the camera. The eagle-eyed may notice that the picture of the quadruple top-stitching below doesn’t match the technical drawing. I decided to omit the slits at the ankle. 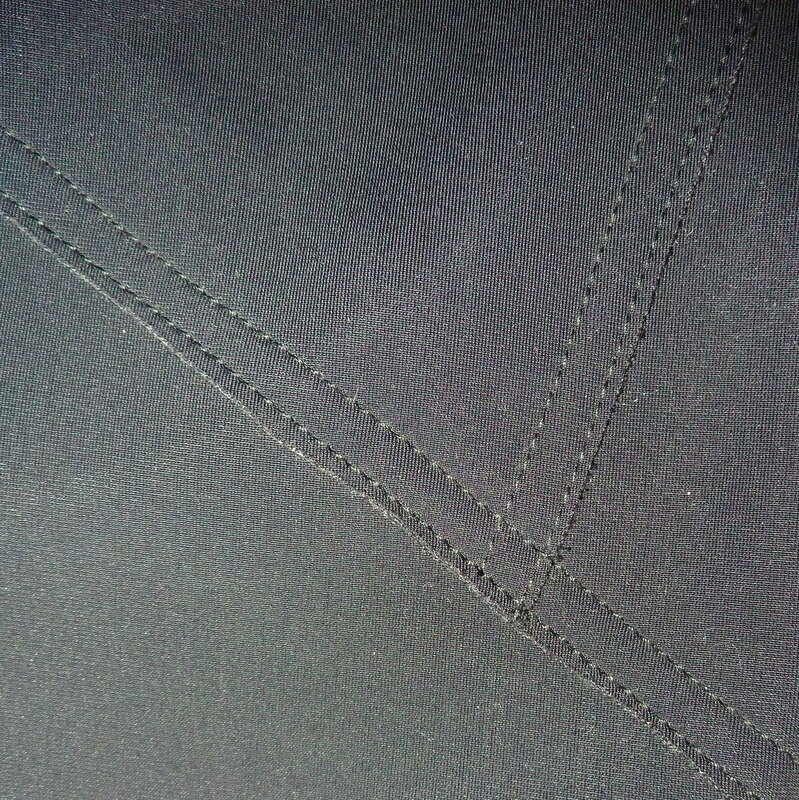 Thin neoprene is fantastically easy to top-stitch. It’s stable, smooth, and very easy to mark with chalk. 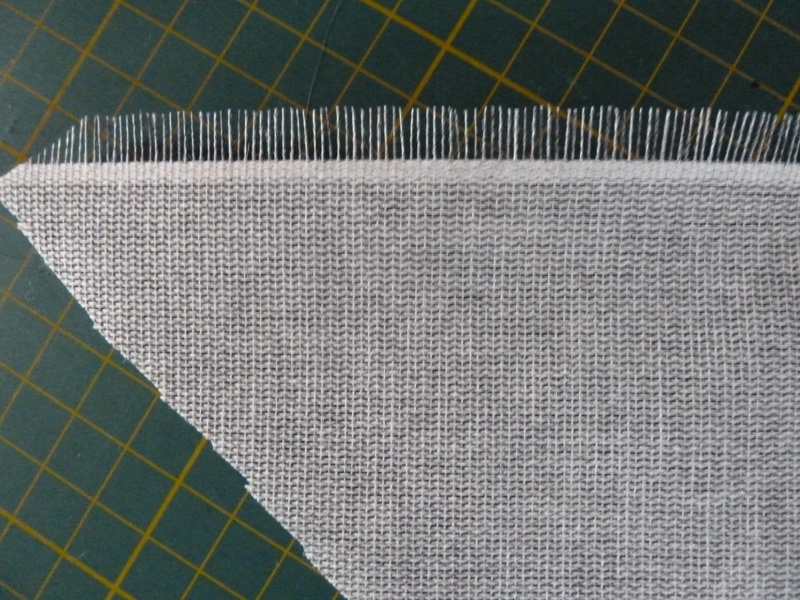 I made a paper guide for the curved top-stitching lines in the picture above and transferred the lines to the right side of the fabric using a chalk wheel. The chalk just wipes off with a damp cloth when you’re done. 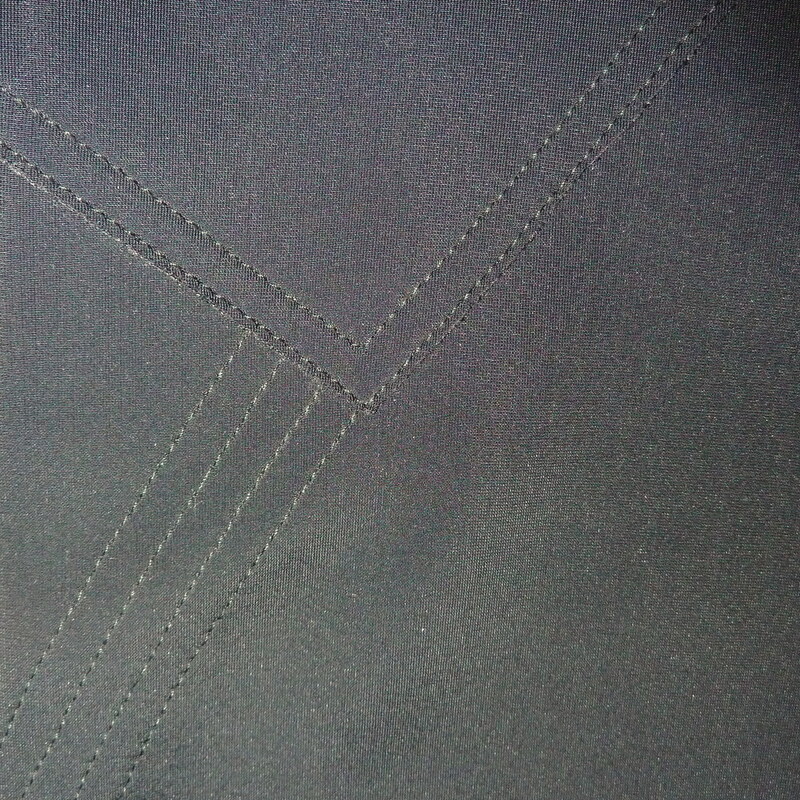 For the lapped seams I marked the stitching and placement lines with chalk. I didn’t bother making templates for that but used my seam gauge. I used a few pins here and there to hold things together while I sewed, but they don’t seem to have damaged the fabric. 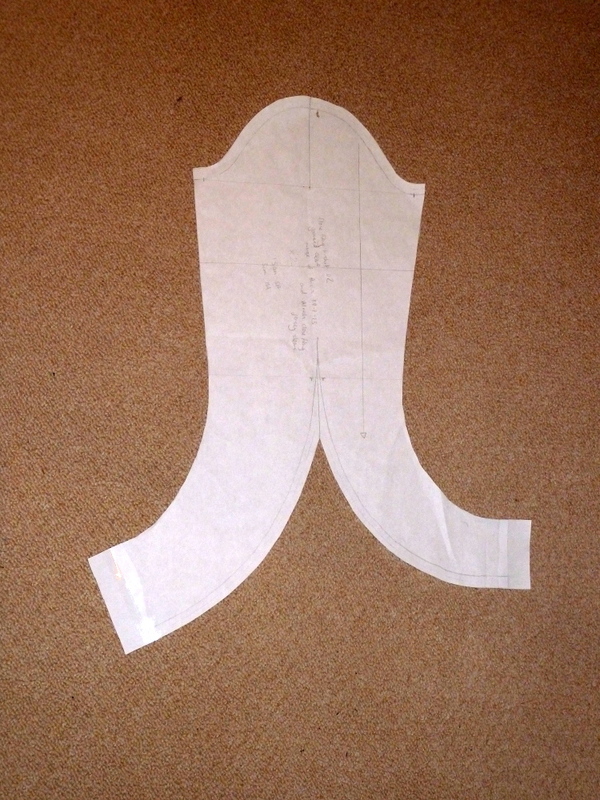 As well as the lapped seams there are also some regular seams. I sewed those using my machine’s triple stretch stitch for maximum durability. Pressing those open was something of a battle. I had most success when I pressed with a fairly hot iron and no steam, and then put a heavy book on top until they cooled. Hopefully I’ll have some daylight pictures of the finished object next week. Sometimes the pattern comes first, sometimes the fabric. 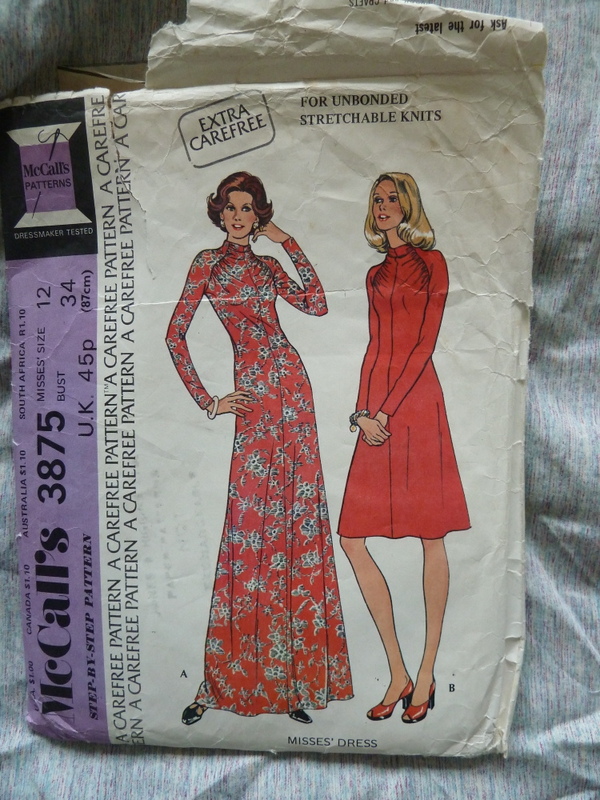 A few months ago I bought an interesting remnant in the sale room at Misan Fabrics. 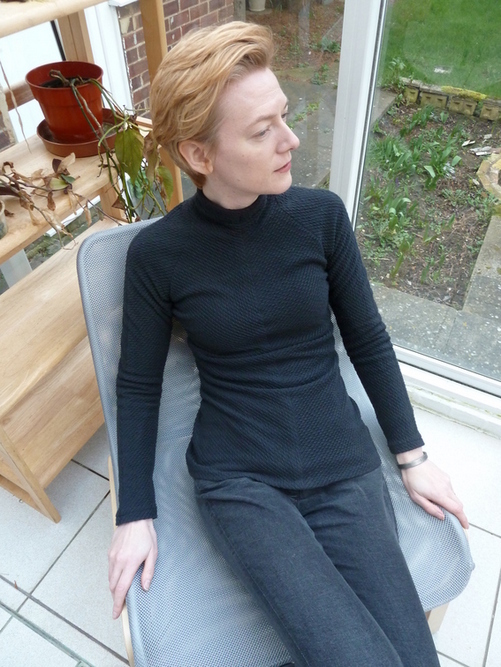 It’s a highly textured blue knit on a black backing. The textured side has what I can only describe as ripply stripes. I didn’t have any immediate plans for it but it was too good to pass up: warm, stretchy, and a bit different. It came out of the stash recently when I was wanting another knit top. I thought about making it up as a plain long sleeved t-shirt shape, but I feared so many horizontal stripes might be overwhelming. In my scrapbook I found a picture of a dress made from a fabric with a similar textured stripe. It had a centre front seam with the stripes placed on the bias, making a chevron effect. 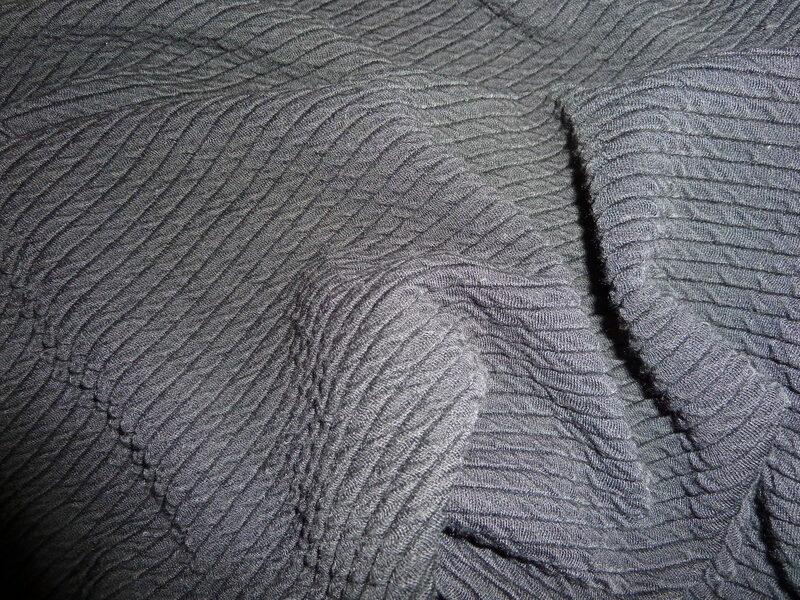 That worked well: it showed off the texture but the fabric wasn’t the only thing that you’d notice about the design. 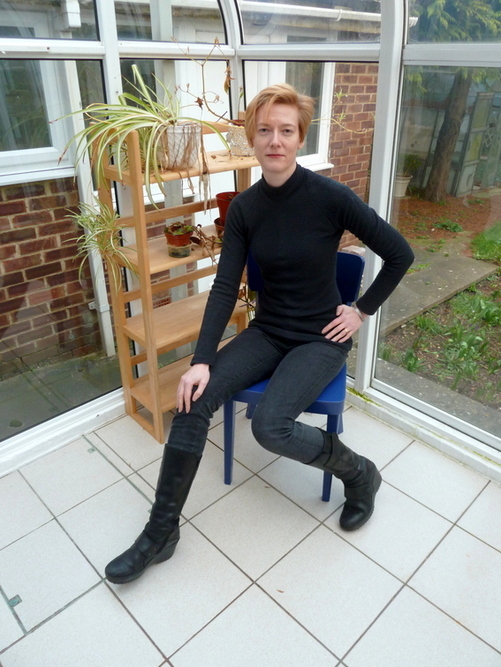 The knit top/dress out of Vogue 8866 came to mind as a suitable pattern to start with to reproduce the effect. 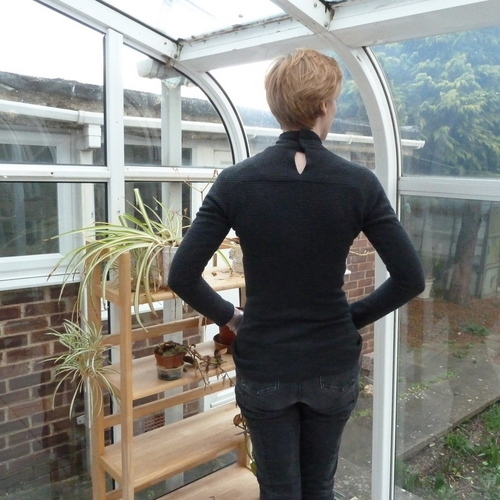 It has a centre front seam and raglan sleeves. 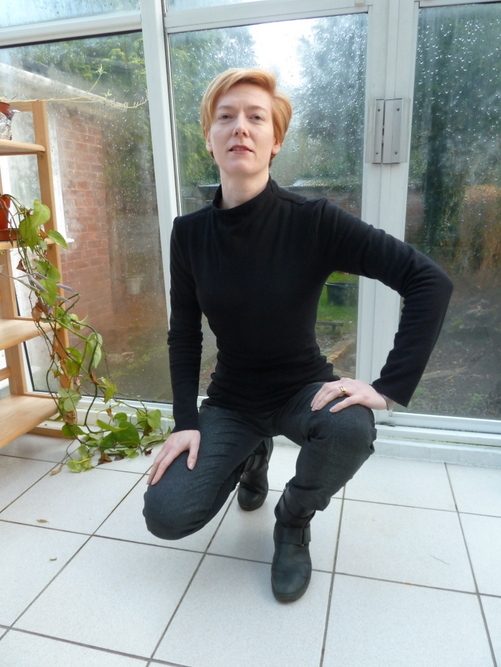 I’d already made it up once before in sparkly silver knit so I knew the fit was OK. 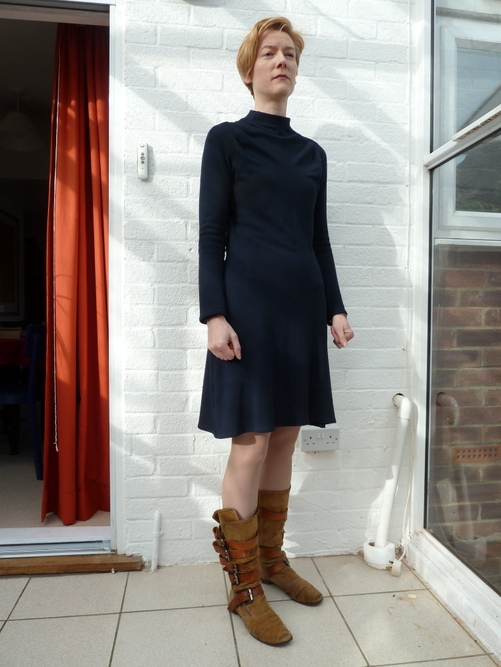 I made the neckline a bit higher than the original pattern has it, and cut the front panels on the bias. 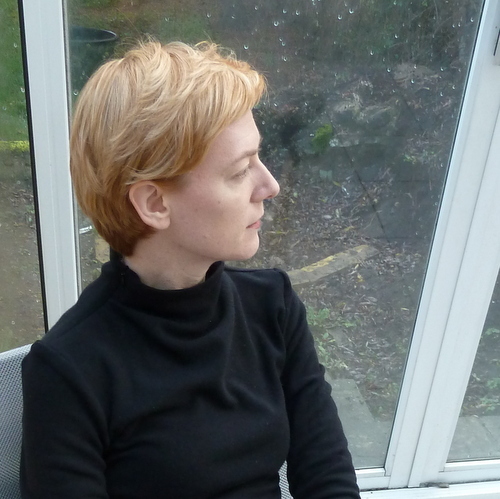 I faced the neck with a plain black viscose jersey rather than self fabric. I also skipped all the top-stitching from the original pattern as I think it would have looked odd with the stripes. I really should have cut the back yoke on the bias. That wobbly horizontal seam across the upper back is my sixth attempt to make the stripes look balanced. I promise the previous five goes were even worse. 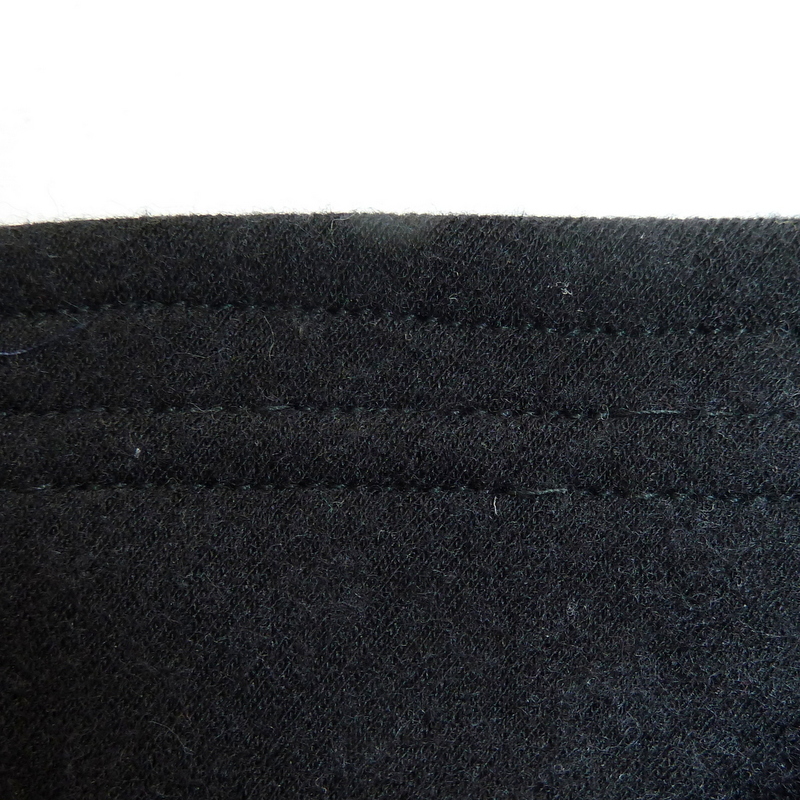 Fortunately the fabric doesn’t mind unpicking, and the seam isn’t really visible unless you look closely. I made a slight effort to match the stripes across the vertical back seams. Everywhere else there was no need because of the bias panels and raglan seams. I extended the neck to make an underlap on one side and added snaps for the closure. Vogue uses hooks and eyes but I don’t see how they would stay fastened once you started moving about – not unless you made the neck really tight anyway. Also snaps are easier to sew. 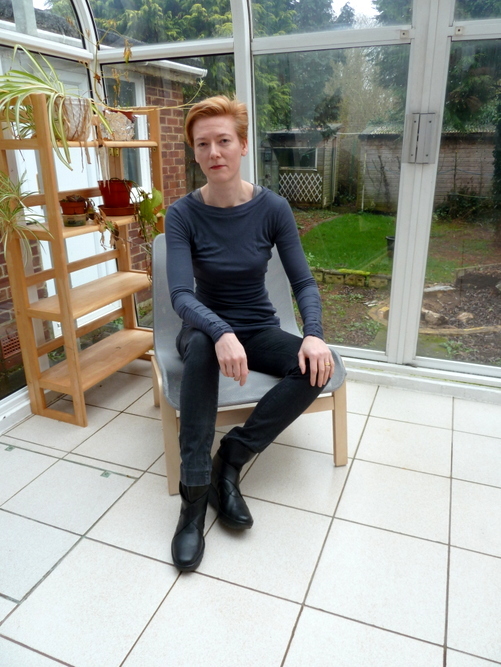 I don’t like hand sewing, so the hem on this was done with my sewing machine’s blind hem function and the sleeve hems are machine stitched with a narrow zigzag. The only hand sewing is the snaps. This isn’t such a good picture of the top but I like it because it shows the whole outfit. 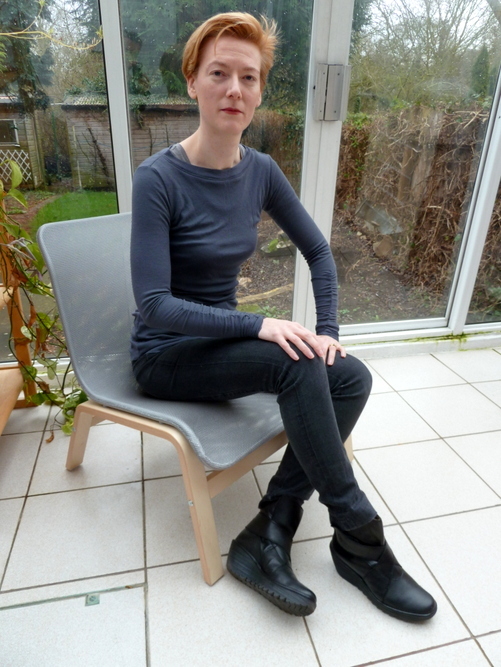 I sometimes wear ridiculous shoes for blog photos, but this is actually how I’ll wear this top in practice, with jeans and boots. Hope that keyhole at the back isn’t too drafty!